CHAMPAIGN, Ill. — Scientists have built a "computational microscope" that can simulate the atomic and subatomic forces that drive molecular interactions. 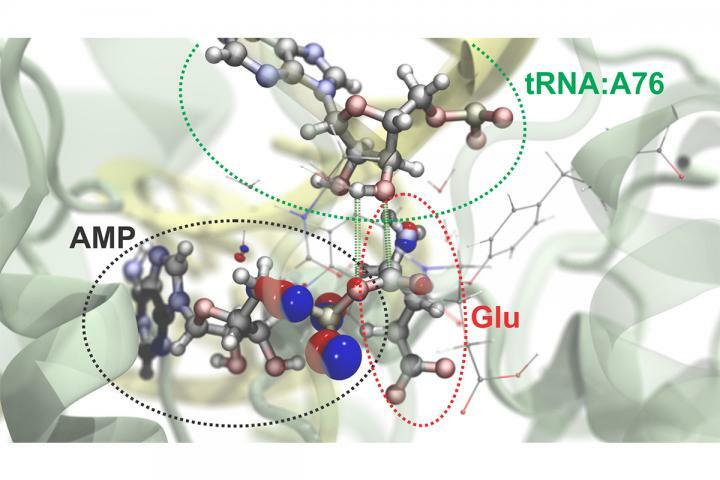 This tool will streamline efforts to understand the chemistry of life, model large molecular systems and develop new pharmaceutical and industrial agents, the researchers say. They report their findings in the journal Nature Methods. The scientists combined two computational approaches used to simulate molecular interactions. The first, a nanoscale molecular-dynamics program known as NAMD, uses classical-mechanics methods to model the structure and simulate the behavior of hundreds of millions of individual atoms. The second program zooms in on the subatomic realm, simulating the interactions of protons, neutrons and electrons. Modeling at this quantum-mechanical scale demands a lot of computational power, so the researchers implemented a method for partitioning large molecules into classical- and quantum-mechanics regions. This allows them to focus their computational resources on small regions involved in critical interactions, such as the making or breaking of chemical bonds. Both molecular mechanics and quantum mechanics programs have been available for years, and other teams have worked to combine them, said University of Illinois chemistry professor Zaida (Zan) Luthey-Schulten, who led the new research with her husband, U. of I. physics professor Klaus Schulten. But the new effort streamlines the process of setting up, performing and analyzing the simulations. "We set it up so that researchers can easily choose how they will partition their own systems," Luthey-Schulten said. "My own students are trying it out, and most of them are able to do it without much difficulty." Schulten developed NAMD at Illinois in 1995, combining it with a visualization software, VMD, which enables researchers to watch large-scale molecular interactions unfold. Schulten, who died in 2016, equated this approach to "building a computational microscope." The computational microscope is ideal for modeling structural traits and motions of large complexes. For example, in 2013, Schulten and his colleagues used NAMD to model the HIV capsid, which is made up of more than 1,300 identical proteins that assemble into a cagelike structure that protects the virus until it enters a host cell. That simulation accounted for the interactions of more than 64 million atoms and required the use of the Blue Waters supercomputer at the National Center for Supercomputing Applications at the U. of I. The new study also made use of Blue Waters, this time to improve the resolution of the computational microscope. The NAMD software is designed to describe the behavior of individual atoms. But individual atoms involved in specific chemical interactions and reactions don't always behave like their counterparts elsewhere. Understanding how they vary requires a closer look at the subatomic forces at play. This is particularly important in the dynamic regions of molecules – for example, those places where chemical bonds are made or broken, the researchers said. In the new study, the research team at Illinois teamed up with QM experts Frank Neese, of the Max Planck Institute for Coal Research in Mulheim an der Ruhr, Germany; and Gerd B. Rocha, of the Federal University of Paraiba, in Joao Pessoa, Brazil. The subatomic simulations of the interactions of the two regions allowed the team to run simulations of four different scenarios that would allow the tRNA to function as it does in the cell. Their simulations revealed that one of the four potential chemical pathways was more energetically favorable than the others and thus more likely to occur. The researchers also used various methods to partition the tRNA complex between the MM and QM regions and reported on each approach. "We didn't pick just one way; we picked as many as possible. We give the user freedom. How you structure it really depends on the particular system you're studying," said U. of I. postdoctoral researcher Rafael Bernardi, a co-lead author on the study with graduate student Marcelo Melo. "We don't do the whole system quantum mechanically because that would take forever to calculate," Melo said. "NAMD was designed – and this was my husband's vision – to treat really large systems," Luthey-Schulten said. "Now we can add the subatomic scale to that, opening up vast new possibilities for research." The molecular dynamics tools developed at the U. of I. are freely available to the public. This research was conducted in part at the National Institutes of Health Center for Macromolecular Modeling and Bioinformatics at the Beckman Institute for Advanced Science and Technology and the National Science Foundation Center for the Physics of Living Cells at the U. of I. The National Science Foundation, the National Institutes of Health and the Keck Foundation support this research. The paper "NAMD goes quantum: An integrative suite for hybrid simulations" is available online and from the U. of I. News Bureau.